Our team is here to make your molecule into medicine. Our experts have worked in clinical trials for over 25 years gaining extensive experience in oncology, neurology, cardiovascular diseases, gastroenterology, immunology as well as a host of other therapeutic areas. Our international experts, in your target regions. Our unrivaled local expertise on regulatory authority strategies, ethics review processes and relations with specialized investigators enable us to provide proven competitive timelines and exceed your expectations. In 22 years of debt-free clinical research development, over 90% of our Sponsors have expressed intent to repurchase or intent to recommend. We have built relationships with primary investigators and patient clinics in the following countries: Austria, Belgium, Canada, every country in Scandinavia, Ireland, and Switzerland. Let us put these relationships to work moving your compound to regulatory approval. Since 1997, we have committed ourselves to excellence in serving agile and emerging biopharmaceutical companies. We believe that providing customized, personal service is what sets us apart from other clinical research organizations. Our Sponsors have found that PSNResearch is devoted to building relationships with all stakeholders in the complex process of clinical development. The most important guiding principle we follow is this: no other CRO, no other service organization, will go to the lengths that we will to make you successful in your clinical research. 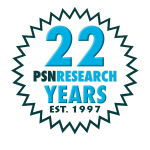 It is this steadfast pledge with which we conduct all of our engagements – and our Sponsors have supported this by returning to PSNResearch, again and again.